One game I bought that I forgot to mention in my last blog was Brutal Legend. Then again, Brutal Legend to me always seemed pretty forgettable. Despite my love for Psychonauts and Double Fine as a developer, Brutal Legend didn’t take my interest upon release. I suppose boring videos and sub-par reviews didn’t help matters. I decided to start-up the game last week to get it out of the way (at the $10 bargain bin price, I wouldn’t feel bad for not finishing it). My initial impressions of the game did little to change my already clouded opinion. Sure, as any game that Tim Schafer has worked on, the dialogue was fantastic, but the gameplay left something to be desired. Hacking away at dudes feels like a poor God of War clone – a series I was already not a big fan of! And while the graphics were certainly an improvement on Psychonauts, the environments of Brutal Legend lacked the inspiration buzzing through the former. 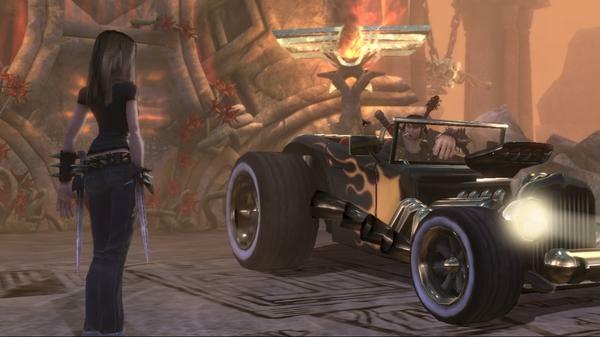 However, after zipping through the boring openworld environment of Brutal Legend in my hot rod I decided to check out the track-list and I was amazed at how awesome it was! I was no fan of Heavy Metal, but this music made me a believer! Black Sabbath, Kiss, Judas Priest, Motorhead, and Def Leppard probably would have seemed like a killer soundtrack to one who knew better, but it would have flew by me. I would go so far as to say that with 107 mostly good to riff-tastic songs, Brutal Legend has the best game soundtrack ever! First of all, by making such a knee-jerk statement I’m not including Brutal Legend among the traditional game soundtracks. This traditional game music is anything from the chiptunes of Mega Man to the melodies of Final Fantasy. No, Brutal Legend soundtrack puts it among the Tony Hawks, Grand Theft Autos, Guitar Heroes, and Rock Bands. And aside from those franchises I just mentioned… there are not a lot of other notable contenders against Brutal Legend. Tony Hawk typically has a good soundtrack, but there’s maybe 20 songs total in each game. The Rock Bands and Guitar Heroes have big soundtracks however they usually have a setlist that will appeal to everyone... so what you get is a mixed bag. The only close competition would be GTA: Vice City. Its soundtrack is about as big as Brutal Legend’s and is also very good. Still, I prefer Brutal Legend selection of assorted metal to Vice City’s mainstream 80s tunes. So I stand behind my statement! At this point, I have downloaded most of the Brutal Legend soundtrack, but I still love hearing the music come out of my TV speakers. So I will continue playing the game for now. Part of me feels the game would have been better as a platformer or even an adventure game, however. Still, somehow I doubt such a game could have justified a soundtrack like this. I’m glad with what Brutal Legend is because - regardless of how long I play the game - I now have enough great bands to listen to for many coming years!